Facebook-owned Instagram announced a new addition to its photo-sharing app on Wednesday: the ability to share long-form 4K videos a la YouTube. With IGTV, Instagram will allow its 1 billion monthly active users – a milestone it also announced on Wednesday – to create and share videos up to an hour long. That’s about 59 minutes longer than the videos it currently allows users to upload with Instagram stories. Long-form video sharing is a territory owned by very few social media platforms, and Instagram has clearly seen success with what it’s been doing so far. So why the update? As this chart from Statista shows, Instagram and Facebook executives have reason to believe this would be a profitable arena. 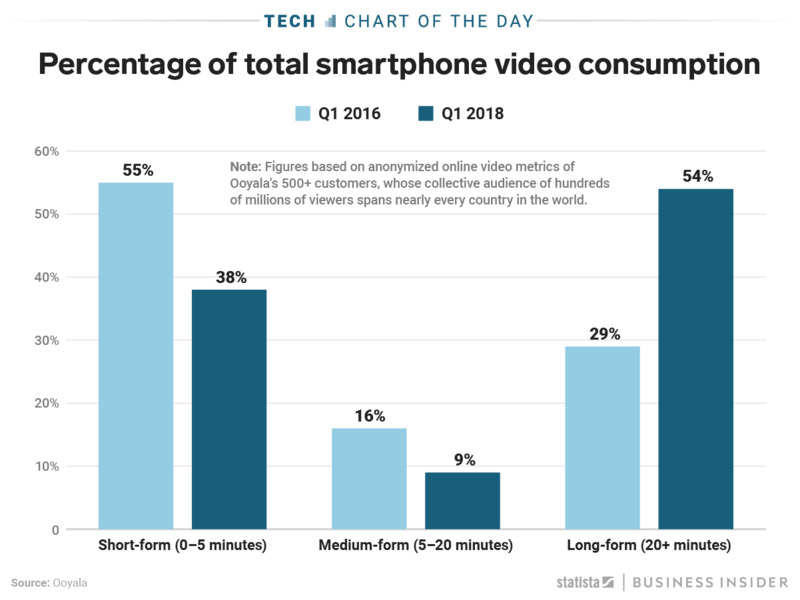 While “medium-form” video (5-20 minutes in length) has gotten relatively little attention, short-form video and long-form video have switched places in terms of the proportion of time people are willing to allot to one or the other, according to video analytics company Ooyala. Two years ago, users would spend about 26% more of their time on videos under 5 minutes long, but they’re now spending 16% more of their time on videos longer than 20 minutes, indicating a shift in the industry – and ad dollars. Though there won’t be ads on IGTV to start, Instagram CEO Kevin Systrom has said advertising “is obviously a very reasonable place to end up” and that creators will have a way to make a living. Instagram has already put competitor Snapchat in a perilous situation, and if the pay for content creators is good, YouTube could very well be its next victim.